The public continues to support U.S. drone strikes targeting extremists in Pakistan and elsewhere, despite ongoing concerns that drone attacks endanger lives of innocent civilians. The national survey by the Pew Research Center, conducted May 12-18 among 2,002 adults, finds that 58% approve of the U.S. conducting missile strikes from drones to target extremists in such countries as Pakistan, Yemen and Somalia. About a third (35%) disapprove of U.S. drone attacks. Public opinion about U.S. drone strikes has changed only modestly since February 2013, when 56% approved and 26% disapproved of drone attacks. 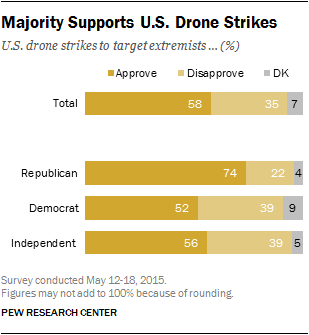 Support for drone strikes crosses party lines, though Republicans (74%) are more likely than independents (56%) or Democrats (52%) to favor the use of drones to target extremists. While men approve of drone attacks by more than two-to-one (67% to 28%), the balance of opinion is much narrower among women. Half (50%) of women approve of the use of drones to target extremists, while 42% disapprove. The public’s concerns about possible consequences from drone attacks also are little changed from two years ago. 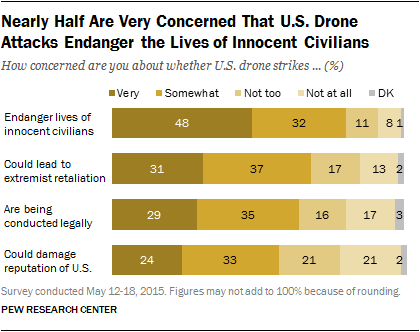 Overall, 48% say they are very concerned that U.S. drone strikes endanger the lives of innocent civilians, while another 32% say they are somewhat concerned about this. Earlier this year, two hostages, including one American, were killed by a U.S. drone strike targeting an al Qaeda compound along the Afghanistan-Pakistan border. The public expresses less concern over other potential consequences of U.S. drone attacks. About three-in-ten or fewer say they are very concerned U.S. strikes could lead to retaliation from extremist groups (31%), that they are being conducted legally (29%) or that they could damage America’s reputation around the world (24%). The survey finds continued public pessimism about the U.S. military mission in Afghanistan. 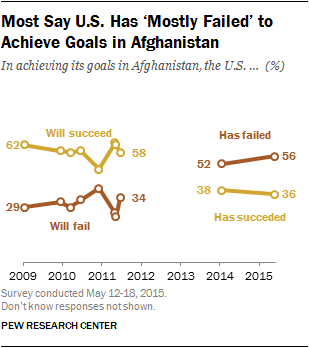 A majority (56%) says the United States has mostly failed in achieving its goals in Afghanistan; 36% say the United States has mostly succeeded. These views are little changed from early last year. A declining share of Americans sees prospects for long-term stability in Afghanistan. Just 29% say it is likely that Afghanistan will be able to maintain a stable government following the departure of U.S. forces from the country. More than twice as many (68%) say this outcome is unlikely. These opinions have become more negative since 2011, when 38% saw some likelihood of Afghanistan maintaining a stable government after U.S. forces left the country. Meanwhile, President Obama’s plan to delay the withdrawal of some 10,000 U.S. forces from Afghanistan, which he announced in March, draws bipartisan support. Overall, 58% approve of Obama’s decision to keep the troops in Afghanistan through the end of this year, while 39% disapprove. Majorities of Democrats (60%), independents (59%) and Republicans (58%) approve of Obama’s decision. There are significant differences in views of U.S. drone strikes across demographic groups, including differences by age, gender, race and ethnicity, and education. Young adults are among the least likely to approve of the drone attacks. Among those ages 18-29, about as many disapprove of the drone attacks (50%) as say they approve of them (48%). Among all older age cohorts, majorities express support for the attacks. Across racial and ethnic groups, whites (66%) are far more likely to approve of the drone attacks than are blacks (46%) and Hispanics (39%). About two-thirds of college graduates (66%) and those with some college experience (64%) say they approve of the U.S. conducting missile strikes from pilotless aircraft to target extremists. Among those with no college experience, 49% approve of the drone attacks, compared with 42% who say they disapprove. Nearly three-quarters of Republicans (74%) approve of the drone attacks, compared with smaller majorities of independents (56%) and Democrats (52%). There is a divide within the Democratic Party on the U.S. use of drones: Conservative and moderate Democrats approve of the drone attacks by a 56%-36% margin. By contrast, liberal Democrats are about evenly divided (48% approve, 45% disapprove). Partisan differences in overall views of U.S. drone strikes extend to concerns over whether they endanger the lives of innocent civilians. 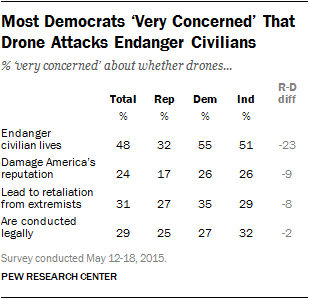 Democrats (55%) are 23 points more likely than Republicans (32%) to say they are very concerned about whether U.S. drone strikes endanger the lives of innocent civilians. Independents’ views are similar to those of Democrats: 51% say they are very concerned about the possibility of civilian casualties from drone attacks. On other possible concerns such as damage to America’s reputation, retaliation from extremists, and whether the attacks are being conducted legally, partisan differences are more modest, as relatively few from either party say they are very concerned about these potential issues. In addition to expressing lower levels of support for the U.S. drone strikes generally, women also are more likely than men to express a high level of concern over a range of possible concerns about the attacks. Overall, 54% of women say they are very concerned about whether U.S. drone strikes endanger the lives of innocent civilians. Among men, 41% express this level of concern about the possibility of civilian casualties. Women are 16 points more likely than men to say they are very concerned that the drone attacks could lead to retaliation from extremist groups: 39% of women say this compared with 23% of men. When it comes to concerns about whether the U.S. drone strikes are being conducted legally and whether they damage America’s reputation around the world, women are about 10 points more likely than men to say they are very concerned about each of these issues. Overall, 56% say that the United States has mostly failed in achieving its goals in Afghanistan, compared with 36% who say it has mostly succeeded. The current negative state of opinion stands in contrast to views measured in surveys conducted from 2009 to 2011. For example, in May 2011, shortly after U.S. forces killed Osama bin Laden, 62% answered a forward-looking question by saying they thought the U.S. would definitely or probably succeed in achieving its goals. By January 2014, however, public sentiment had turned negative when asked to assess whether the U.S. had succeeded in achieving its goals in Afghanistan (52% mostly failed, 38% mostly succeeded). The decline in assessments of U.S. achievements in Afghanistan has occurred across party lines. 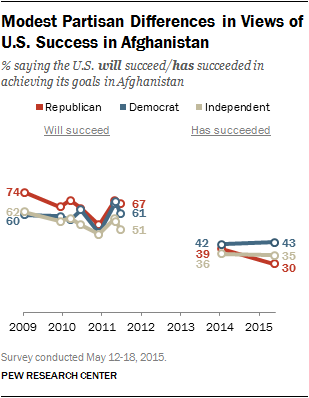 In June 2011, most Republicans (67%) and Democrats (61%) said they thought the U.S. would definitely or probably succeed in achieving its goals in Afghanistan. The current survey finds opinion is much more negative among both groups: fewer than half of Republicans (30%) and Democrats (43%) now say they think the U.S. has mostly succeeded in achieving its goals in Afghanistan. Perceptions of the future stability of the government in Afghanistan have become more negative since last measured in June 2011. Four years ago, the public also had doubts about the ability of Afghanistan to maintain a stable government after the withdrawal of U.S. troops, but doubts outweighed optimism by a narrower margin (57% unlikely vs. 38% likely). Fully 68% of Americans say it is either very unlikely (35%) or somewhat unlikely (33%) that Afghanistan will be able to maintain a stable government after U.S. forces leave the country. About a quarter (24%) say it is somewhat likely Afghanistan will be able to maintain a stable government and just 5% say this is very likely. As is the case with views of U.S. success in Afghanistan, there are only modest partisan differences on the question of whether Afghanistan will be able to maintain a stable government once U.S. troops leave the country. Majorities of Republicans (74%), independents (69%) and Democrats (62%) say it is either very or somewhat unlikely that the Afghan government will be stable after the withdrawal of U.S. troops.